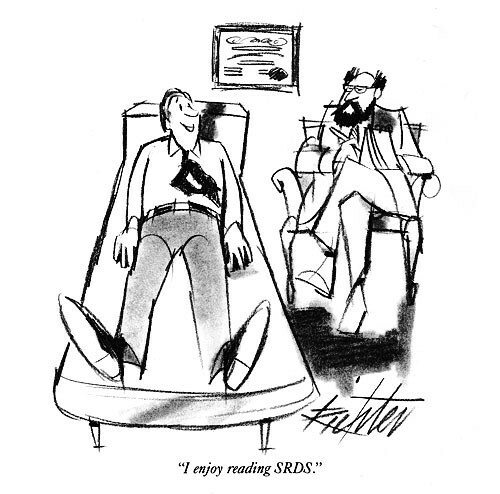 Home > Thinking & Resources > Blog > Friday Flashback: "I Enjoy Reading SRDS"
Friday Flashback: "I Enjoy Reading SRDS"
When you've been around as long as we have (SRDS was founded as Standard Rate and Data Service in 1919), you tend to collect a pretty nice collection of memorabilia and nostalgic material. We've been a part of the growth of the advertising and media business for many decades, and thought it would be fun to take some occasional Friday afternoons to share some SRDS—and industry—history. First up is a cartoon by produced by Bradley & Faecher to be used in various ad industry trade publications in 1987. More of these gems in the coming weeks. In the meantime, have a wonderful weekend!